"A serious look at marketing that made me laugh out loud! Gravitational Marketing is something anyone can use and everyone can afford. These guys get it!" "Reading this book can put zeros on your income and customers in your business. It will challenge everything you believe about what it takes to get people to do business with you. This book takes marketing to a whole new level!" "This book will transform your marketing mindset in ways you never thought possible. It′s packed with ideas to empower your entrepreneurial engine to new heights." Nido Qubein, President, High Point University, and Chairman, Great Harvest Bread Co.
"Jimmy Vee and Travis Miller have reinvented the art of sales and marketing. 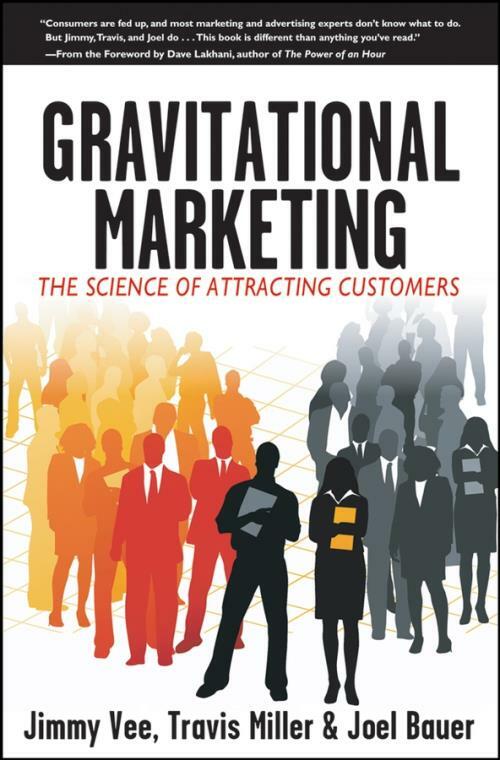 Gravitational Marketing can teach even the biggest skeptics how to increase sales...without even trying." Kevin Baumann, CEO, JKR DeFalco Advertising, and former director of strategic development, Nissan Motor Corp.
"If you′d rather pull customers toward your business naturally than be a pushy salesperson, Gravitational Marketing is the approach you′ve been looking for." C.J. Hayden, author of Get Clients Now! "Gravitational Marketing is a doorway to the next step in the evolution of marketing. Do what this book says to do and you′ll make more money and have more fun doing it." "This book is full of great tips that are bound to ignite your marketing imagination." "This is the truth about your business and how to get more of it." "If you′re one of the millions of sales and marketing professionals who want to sell more and work less, read this book right now." Part One. The Laws Of Gravitational Marketing. Chapter 1. The Power of Gravity. Chapter 2. Anatomy of Gravitational Marketing. Chapter 3. How to Be Worthy of Attraction. Chapter 4. The Newton in All of Us. Chapter 5. The Object of Your Attraction. Chapter 6. Increase Your Gravitational Potential. Chapter 7. Creating Irresistible Attraction. Part Two. Gravitational Marketing Attraction Techniques. Chapter 8. Activate Your Gravitational Attraction. Chapter 9. Attracting Through Personal Effort. Chapter 10. Attracting Through Direct Mail. Chapter 11. Attracting Through Print. Chapter 12. Attracting Through Free Publicity. Chapter 13. Attracting Through the Internet. Chapter 14. Attracting Through Radio & Television. How To Get More Jim & Travis. How To Get More Joel Bau.